Plot: Gloria finds a power she never knew she had when she is drawn into a dangerous world of cross-border crime. Surviving will require all of her cunning, inventiveness, and strength. Based on the Spanish-language film. Starring: Gina Rodriguez, Thomas Dekker, Vivian Chan, Barbarella Pardo. 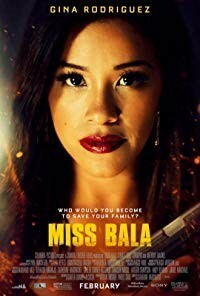 distributed by Sony / Columbia «Miss Bala» in the US movie theaters released on February 1, 2019 and has grossed over $15 million worldwide; dvd and blu-ray release date was set for April 30, 2019. Rent from Netflix and Redbox from April 30, 2019. «Miss Bala» in the UK released in movie theaters on March 8, 2019. The movie estimated to release on dvd and blu-ray some time in June or July 2019.